Giant reed and salt cedar disrupt the riverbanks and floodplains. Of the invasive species threatening Texas watersheds, not all actually live in water. Some colonize stream banks and floodplains, disrupting the riparian environment. Arundo and salt cedar are among the worst. Arundo (Arundo donax), also called giant reed or carrizo cane, is a grass that grows up to 30 feet tall. Its plume-like flower heads appear in fall, but it spreads mostly by way of horizontal stems (rhizomes) that run along the ground. It grows in thickets near rivers and creeks all over Texas and is frequently seen on roadsides. In the Hill Country, it degrades the habitat of our state fish, the Guadalupe bass. 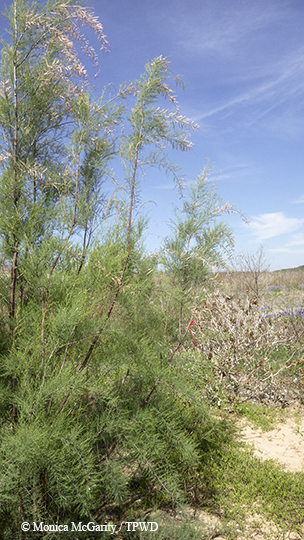 Salt cedars (Tamarix species) are shrubby, many-branched trees with green, wispy foliage. Clusters of small pink flowers appear at the branch tips in summer. Leaves turn rust-colored before they drop in fall. Seeds can travel by wind or water, but salt cedar also sends up new shoots from roots and submerged stems. It has long been a problem in West Texas, spreading gradually eastward as it follows rivers downstream. In the upper Brazos, salt cedar threatens the habitat of two minnows recently added to the federal endangered species list. Both plants are native to the Mediterranean region, with some salt cedars ranging east to Asia. Both were introduced to North America in the 1800s — salt cedar as an ornamental that would grow in dry climates and arundo to control erosion. In a few decades, they escaped cultivation to thrive and multiply in countless places where they aren’t wanted. Riparian invaders displace native plant communities along riverbanks and degrade instream habitat for aquatic life. 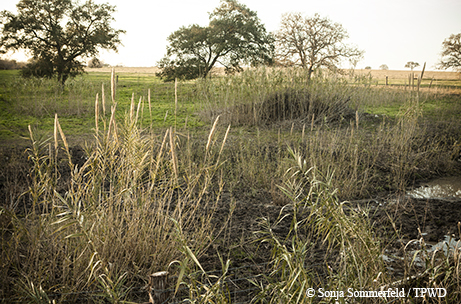 Arundo and salt cedar consume large amounts of water, so much that they can actually reduce stream flow. Ironically, they can also make floods more destructive, forming dense stands that hamper a floodplain’s ability to do its job. Both are highly flammable, increasing wildfire danger. While arundo does tend to stabilize the top few inches of a riverbank, the soil beneath its tangle of roots becomes more vulnerable to erosion, bank collapse and undercutting. Find out more at www.texasinvasives.org. Controlling these plants requires an integrated approach. The most successful efforts involve judicious use of herbicides, often followed by plantings of native vegetation. Many infested areas are on private property, so the Texas Parks and Wildlife Department is working with streamside landowners, hosting informational workshops and enlisting partners to participate in area-wide management plans. For details, contact healthycreeks@tpwd.texas.gov.